Wheat flour, butter, milk, eggs, yeast. A Danish pastry or just a Danish (especially in American English) is a multilayered, laminated sweet pastry in the viennoiserie tradition. The concept was brought to Denmark by Austrian bakers and has since developed into a Danish specialty. Like other viennoiserie pastries, such as croissants, it is a variant of puff pastry made of laminated yeast-leavened dough that creates a layered texture. Danish pastries were brought with immigrants to the United States, and are now popular around the world. Danish pastry is made of yeast-leavened dough of wheat flour, milk, eggs, sugar, and large amounts of butter or margarine. A yeast dough is rolled out thinly, covered with thin slices of butter between the layers of dough, and then the dough is folded and rolled several times, creating 27 layers. If necessary, the dough is chilled between foldings to ease handling. The process of rolling, buttering, folding, and chilling is repeated multiple times to create a multilayered dough that becomes airy and crispy on the outside, but also rich and buttery. Butter is the traditional fat used in Danish pastry, but in industrial production, less expensive fats are often used, such as hydrogenated sunflower oil. A common version of the pastry in Denmark, Norway, Finland, and Sweden. In Danish, Norwegian, and Swedish, the term for Danish pastry is wienerbrød or wienerbröd, meaning "Viennese bread". The same etymology is also the origin of the Finnish viineri. In Vienna, the Danish pastry is called Kopenhagener Plunder, referring to Copenhagen, or Dänischer Plunder. The origin of the Danish pastry is often ascribed to a strike amongst bakery workers in Denmark in 1850. The strike caused bakery owners to hire workers from abroad, among them several Austrian bakers, who brought along new baking traditions and pastry recipes. The Austrian pastry of Plundergebäck soon became popular in Denmark and after the labour disputes ended, Danish bakers adopted the Austrian recipes, adjusting them to their own liking and traditions by increasing the amount of egg and fat for example. This development resulted in what is now known as the Danish pastry. 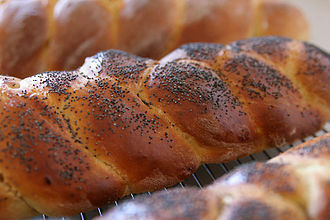 One of the baking techniques and traditions that the Austrian bakers brought with them was the Viennese lamination technique. Due to such novelties the Danes called the pastry "wienerbrød" (Vienna bread) and, as mentioned, that name is still in use in Northern Europe today. At that time, almost all baked goods in Denmark were given exotic names. Danish pastries as consumed in Denmark have different shapes and names. Some are topped with chocolate, pearl sugar, glacé icing, and/or slivered nuts and they may be stuffed with a variety of ingredients such as jam or preserves (usually apple or prune), remonce, marzipan, and/or custard. Shapes are numerous, including circles with filling in the middle (known in Denmark as "Spandauers"), figure-eights, spirals (known as snails), and the pretzel-like kringles. In Sweden, Danish pastry is typically made in the Spandauer-style, often with vanilla custard. In the UK, various ingredients such as jam, custard, apricots, cherries, raisins, flaked almonds, pecans, or caramelized toffee are placed on or within sections of divided dough, which is then baked. Cardamom is often added to increase the aromatic sense of sweetness. In the US, Danishes are typically given a topping of fruit or sweetened cream cheese prior to baking. Danishes with nuts on them are also popular there and in Sweden, where chocolate spritzing and powdered sugar are also often added. In Argentina, they are usually filled with dulce de leche or dulce de membrillo. Several types of Danish pastry in a bakery in Denmark. Danish pastry was brought to the United States by Danish immigrants. Lauritz C. Klitteng of Læsø popularized "Danish pastry" in the US around 1915–1920. 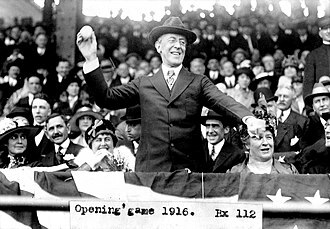 According to Klitteng, he made Danish pastry for the wedding of President Woodrow Wilson in December 1915. Klitteng toured the world to promote his product and was featured in such 1920s periodicals as the National Baker, the Bakers' Helper, and the Bakers' Weekly. Klitteng briefly had his own Danish Culinary Studio at 146 Fifth Avenue in New York City. "At one point during his career Mr. Gertner befriended a Danish baker who convinced him that Danish pastry might be well received in New York. Mr. Gertner began serving the pastry in his restaurant and it immediately was a success." During the Jyllands-Posten Muhammad cartoons controversy in 2006, several religious Iranian groups advocated changing the name of the highly popular Danish (Shriniye Danmarki), given its name association with the source country of the offending cartoons. The Association of Iranian Confectionery Manufacturing designated "Roses of the Prophet Muhammad" as the new name for danishes made in the country as of 15 February 2006, although compliance with the proposed name in bakeries was mixed and short-lived. Related to this, many protesters in several Muslim countries, angered by the pictures of Muhammad, boycotted Danish goods. "Roses of Muhammad" (Persian: گل محمدی‎ "gole mohammadi", literally: Muhammed flower) is a traditional Persian synonym for a variety of pink rose flowering shrub. ^ a b Alexis Kunsak (24 March 2016). "The patsies whose favourite pastries aren't really Danish". 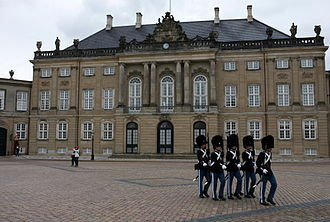 The Copenhagen Post. Retrieved 8 December 2017. ^ Cauvain, Stanley P.; Young, Linda S. (20 May 2007). "Technology of Breadmaking". Springer Science & Business Media. Retrieved 15 December 2017 – via Google Books. ^ Gisslen, Wayne (17 January 2012). "Professional Baking". John Wiley & Sons. Retrieved 15 December 2017 – via Google Books. ^ a b Rose Levy Beranbaum (1998). The Pie and Pastry Bible. Schribner. ISBN 0684813483. ^ "Danish pastry". 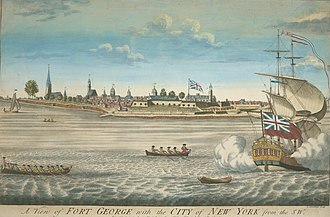 Global.britannica.com. Retrieved 8 December 2015. ^ "In Finland is called viineri". Pohjoisenmakua.wordpress.com. Retrieved 15 December 2017. ^ "Wienerbröd vanilj delbakad dafgård - Torebrings.se". Torebrings.se. Retrieved 15 December 2017. ^ "Produkt ikke funnet". Pdb.no. Retrieved 15 December 2017. ^ "Wienerbrod". Dn.se. Retrieved 15 December 2015. ^ Ole Stig Andersen (Jun 26, 1995). "Hvor kommer brød fra". ^ "Wiener Plundergebäck" (PDF). Lebensministerium.at. Archived from the original (PDF) on 2013-12-10. Je nach Fettmenge können Plunder mit mind. 300 g Fett pro 1000 g Grundteig und dänischer Plunder (Kopenhagener Plunder) mit mind. 600 g Fett pro 1000 g Grundteig unterschieden werden. ^ "Wienerbrød". Arbejdsgiverforeningen Konditorer, Bagere og Chocolademagere. Archived from the original on 2013-01-16. Retrieved 2012-01-17. ^ Inger Abildgaard (1 February 2007). "De danske kager er en fantastisk historie". 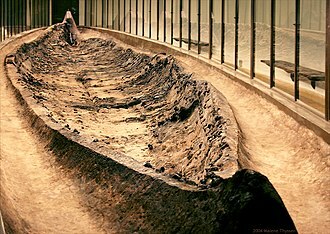 Samvirke (in Danish). Retrieved 16 October 2014. Interview with Bi Skaarup, a Danish food-historian and former president of "Det Danske Gastronomiske Akademi" (The Danish Gastronomical Academy). ^ Karina Porcelli (10 September 2007). "You Call This Danish Pastry?". Saveur, Bonnier Corporation. Retrieved 8 December 2017. ^ Hakon Mielche (1944). Jorden rundt med morgenbrød (in Danish). Hasselbalch. ^ a b "Iranians rename Danish pastries". BBC News. 2006-02-17. Retrieved 2008-04-08. Cauvain, Stanley & Young, Linda S. (2007) Technology of Breadmaking. Springer Science & Business Media. 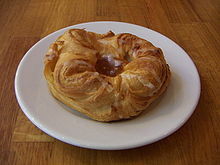 Wikimedia Commons has media related to Danish pastry. Danish pastry - base recipe - Danish pastry bar Kvalifood, a non-commercial educational cooking website from Denmark. Quince cheese, known as dulce de membrillo, is a sweet, thick jelly made of the pulp of the quince fruit. In Australia, it is known as quince paste and predominantly from Portugal and Spain, dulce de membrillo is a firm, sweet reddish hard paste made of the quince fruit. Dulce de membrillo is popular in Australia, America, in Brazil, Argentina, Peru. In Israel it is a typical Sephardi dish, marmalade was made from quinces. The English word marmalade comes from the Portuguese word marmelada, meaning quince preparation, nowadays A marmalade is a jellied fruit product which holds suspended within it all or part of the fruit pulp and the sliced peel. 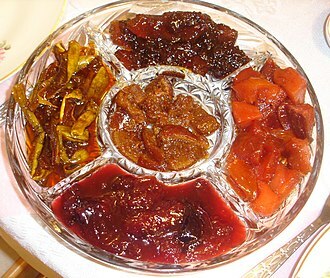 It is prepared from fruits, preferably those that contain pectin. Citrus fruits are especially desirable because of their flavor and pectin content, quince cheese is prepared with quince fruits. The fruit is cooked sugar, turns red after a long cooking time. The taste is sweet but slightly astringent, and it is similar in consistency, flavor and it is often used to stuff pastries. In Spain, Chile and Uruguay, the membrillo is cooked into a reddish gelatin-like block or firm reddish paste known as dulce de membrillo, the Pastafrola, a sweet tart common in Argentina and Paraguay, is usually filled with quince paste. In Argentina and Uruguay, the dulce de membrillo is a dessert, eaten with a slice of cheese. In the Philippines the dessert is known as even if it is made of guava. It is a part of the nochebuena array served on Christmas Eve. In Serbia, especially Vojvodina, all of Hungary, and continental Croatia, i. e. Slavonija quince cheese is an often prepared sweet and is named kitnkes, derived from German Quittenkäse. Quince cheese, a New England specialty of the 18th century, required all-day boiling to achieve a solidified state, in Hungary, quince cheese is called birsalmasajt, and is prepared with small amounts of lemon zest, cinnamon or cloves and often with peeled walnut inside. 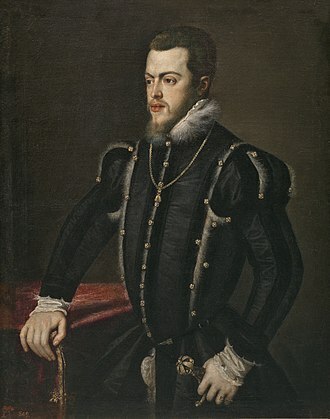 Péter Melius Juhász, the Hungarian botanist, mentioned quince cheese as early as 1578 as a preparation with medical benefits. Eggs are laid by female animals of many different species, including birds, amphibians and fish, and have been eaten by humans for thousands of years. Bird and reptile eggs consist of an eggshell, albumen. The most popular choice for egg consumption are chicken eggs, other popular choices for egg consumption are duck, quail and caviar. Egg yolks and whole eggs store significant amounts of protein and choline, due to their protein content, the United States Department of Agriculture categorizes eggs as Meats within the Food Guide Pyramid. Despite the nutritional value of eggs, there are potential health issues arising from egg quality, storage. Chickens and other egg-laying creatures are widely kept throughout the world, in 2009, an estimated 62.1 million metric tons of eggs were produced worldwide from a total laying flock of approximately 6.4 billion hens. There are issues of variation in demand and expectation, as well as current debates concerning methods of mass production. In 2012, the European Union banned battery husbandry of chickens, bird eggs have been valuable foodstuffs since prehistory, in both hunting societies and more recent cultures where birds were domesticated. The chicken was probably domesticated for its eggs before 7500 BCE, chickens were brought to Sumer and Egypt by 1500 BCE, and arrived in Greece around 800 BCE, where the quail had been the primary source of eggs. 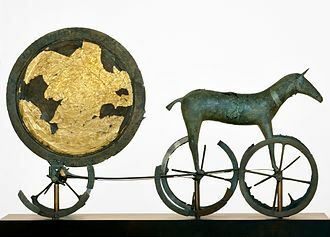 In Thebes, the tomb of Haremhab, built about 1420 BCE, shows a depiction of a man carrying bowls of ostrich eggs and other large eggs, presumably those of the pelican, as offerings. In ancient Rome, eggs were preserved using a number of methods, the Romans crushed the shells in their plates to prevent evil spirits from hiding there. In the Middle Ages, eggs were forbidden during Lent because of their richness, the word mayonnaise possibly was derived from moyeu, the medieval French word for the yolk, meaning center or hub. Egg scrambled with acidic fruit juices were popular in France in the 17th century, the dried egg industry developed in the 19th century, before the rise of the frozen egg industry. In 1878, a company in St. Louis, Missouri started to transform egg yolk and white into a light-brown, the production of dried eggs significantly expanded during World War II, for use by the United States Armed Forces and its allies. Fruit preserves are preparations of fruits and sugar, often canned or sealed for long-term storage. Many varieties of fruit preserves are made globally, including sweet fruit preserves, such as made from strawberry or apricot. In English, the word, in form, preserves is used to describe all types of jams. The term preserves is usually interchangeable with jams, some cookbooks define preserves as cooked and gelled whole fruit, which includes a significant portion of the fruit. In the English speaking world, the two terms are more differentiated and, when this is not the case, the more usual generic term is jam. The singular preserve or conserve is used as a noun for high fruit content jam. Additionally, the name of the type of fruit preserves will vary depending on the variant of English being used. A chutney is a pungent relish of Indian origin made of fruit, mango chutney, for example, is mangoes reduced with sugar. Savory confits, such as made with garlic or fennel, may call for a savory oil, such as virgin olive oil. A conserve, or whole fruit jam, is a jam made of fruit stewed in sugar, in Romania they are known as dulceata. 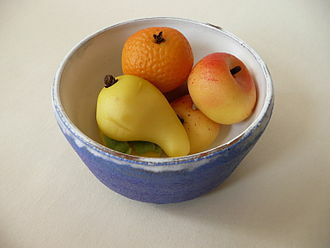 As a result of minimal cooking, some fruits are not particularly suitable for making into conserves. Currants and gooseberries, and a number of plums are among these fruits, because of this shorter cooking period, not as much pectin will be released from the fruit, and as such, conserves will sometimes be slightly softer set than some jams. An alternative definition holds that conserves are preserves made from a mixture of fruits and/or vegetables, Conserves may include dried fruit or nuts. Fruit butter, in context, refers to a process where the whole fruit is forced through a sieve or blended after the heating process. Fruit butters are generally made from fruits, such as apples, plums. Cook until softened and run through a sieve to give a smooth consistency, add sugar and cook as rapidly as possible with constant stirring. … The finished product should mound up when dropped from a spoon, but should not cut like jelly. An apricot is a fruit, or the tree that bears the fruit, of several species in the genus Prunus. The apricot is a tree, 8–12 m tall, with a trunk up to 40 cm in diameter. The leaves are ovate, 5–9 cm long and 4–8 cm wide, with a base, a pointed tip. The flowers are 2–4.5 cm in diameter, with five white to pinkish petals, the flesh is usually firm and not very juicy. Its taste can range from sweet to tart, the single seed is enclosed in a hard, stony shell, often called a stone, with a grainy, smooth texture except for three ridges running down one side. The origin of the apricot is disputed and it was known in Armenia during ancient times, and has been cultivated there for so long that it is often thought to have originated there. 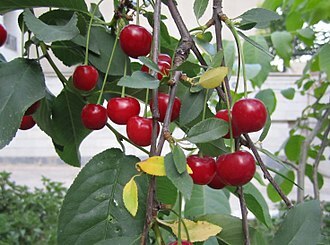 Its scientific name Prunus armeniaca derives from that assumption, for example, the Belgian arborist baron de Poerderlé, writing in the 1770s, Cet arbre tire son nom de lArménie, province dAsie, doù il est originaire et doù il fut porté en Europe. 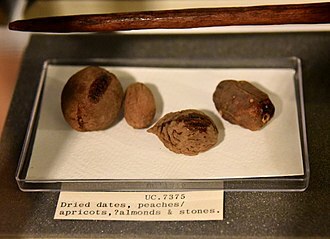 An archaeological excavation at Garni in Armenia found apricot seeds in an Eneolithic-era site, other sources say that the apricot was first cultivated in India in about 3000 BC. Subsequent sources were often confused about the origin of the species, john Claudius Loudon believed it had a wide native range including Armenia, the Caucasus, the Himalayas and Japan. Apricots have been cultivated in Persia since antiquity, and dried ones were an important commodity on Persian trade routes, apricots remain an important fruit in modern-day Iran, where they are known under the common name of zard-ālū. Egyptians usually dry apricots, add sweetener, and use them to make a drink called amar al-dīn, in the 17th century, English settlers brought the apricot to the English colonies in the New World. Most of modern American production of apricots comes from the seedlings carried to the west coast by Spanish missionaries, almost all U. S. commercial production is in California, with some in Washington and Utah. In states other than South Australia, apricots are still grown, particularly in Tasmania and western Victoria and southwest New South Wales, apricot cultivation has spread to all parts of the globe with climates that support it. Bakers yeast is of the species Saccharomyces cerevisiae, which is the same species commonly used in alcoholic fermentation, which is called brewers yeast. Bakers yeast is a single-cell microorganism found on and around the human body, the use of steamed or boiled potatoes, water from potato boiling, or sugar in a bread dough provides food for the growth of yeasts, too much sugar will dehydrate them. Yeast growth is inhibited by both salt and sugar, but more so with salt than sugar and it is not known when yeast was first used to bake bread, the earliest definite records come from Ancient Egypt. The resulting bread would have lighter and tastier than the previous hard flatbreads. Also, the development of leavened bread seems to have developed in proximity to the development of beer brewing. However, beer brewers slowly switched from top-fermenting to bottom-fermenting yeast, refinements in microbiology following the work of Louis Pasteur led to more advanced methods of culturing pure strains. In 1879, Great Britain introduced specialized growing vats for the production of S, the company created yeast that would rise twice as fast, cutting down on baking time. Lesaffre would create instant yeast in the 1970s, which has gained considerable use, Bakers yeast is available in a number of different forms, the main differences being the moisture contents. Though each version has certain advantages over the others, the choice of form to use is largely a question of the requirements of the recipe at hand. 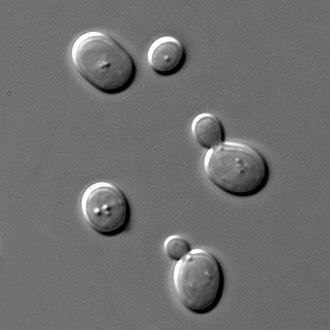 Dry yeast forms are good choices for longer-term storage, often lasting more than a year at room temperatures without significant loss of viability, in general, with occasional allowances for liquid content and temperature, the different forms of commercial yeast are considered interchangeable. Cream yeast is the closest form to the yeast slurries of the 19th century, in essence being a suspension of yeast cells in liquid, siphoned off from the growth medium. Its primary use is in industrial bakeries with special high-volume dispensing and mixing equipment, compressed yeast is, in essence, cream yeast with most of the liquid removed. Marzipan is a confection consisting primarily of sugar or honey and almond meal, sometimes augmented with almond oil or extract. It is often made into sweets, common uses are chocolate-covered marzipan and small marzipan imitations of fruits and it is rolled into thin sheets and glazed for icing cakes, primarily birthday, wedding cakes and Christmas cakes. This use is common in the UK, on large fruitcakes. Marzipan paste may be used as an ingredient, as in stollen or banket. In some countries, it is shaped into small figures of animals as a treat for New Years Day. Marzipan is used in Tortell, and in versions of king cake eaten during the Carnival season. Traditional Swedish princess cake is covered with a layer of marzipan that has been tinted pale green. 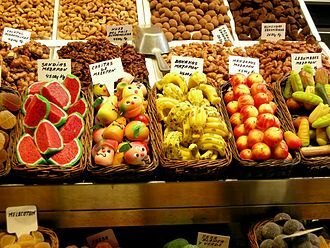 May 9 and 10 are special days for eating marzipan in Sicily, in Portugal, where the confection has been traditionally made by nuns, marzipan is used to make fruit-shaped sweets, in the Algarve region in particular it is a very common sweet. There are other regions, as Toledo in Spain in which marzipan is shaped into animal shapes. In Greece and Cyprus, marzipan is made in a variety of shapes and sizes and is almost always left white, in the islands of the Aegean in particular, white marzipan is considered a wedding treat and is served to guests at wedding feasts. In Malta marzipan is used as a filling in the traditional Maltese Easter treats called Figolla, in the Netherlands and Belgium, marzipan figures are given as presents to children during Saint Nicholass Eve. In Germany, it is common to give marzipan in the shape of a bread, One traditional new year present is known as a Glücksschwein. 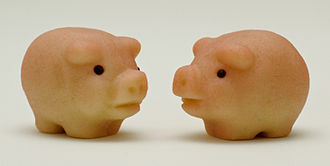 In Denmark and Norway, it is common to eat marzipan pigs for Christmas, in Tallinn, in Maiasmokk café, there is a small museum dedicated to the history and manufacture of marzipan. In the Middle East, marzipan is flavoured with orange-flower water and shaped into roses, Marzipan can be made from oatmeal, farina, or semolina. In Iran, marzipan fruit is a traditional Passover treat, replacing biscuits, in the Indian state of Goa, the Goan Catholic dish Mazpon replaces almonds with cashew nuts and is used to make Easter eggs and Christmas sweets. A raisin is a dried grape. 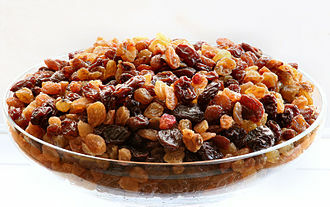 Raisins are produced in regions of the world and may be eaten raw or used in cooking, baking. The word raisin dates back to Middle English and is a loanword from Old French, in modern French, raisin means grape, while a dried grape is a raisin sec, or dry grape. The Old French word, in turn, developed from the Latin word racemus, Raisin varieties depend on the type of grape used, and are made in a variety of sizes and colors including green, brown, blue and yellow. Seedless varieties include the sultana, the Greek currants and Flame grapes, Raisins are traditionally sun-dried, but may be water-dipped and artificially dehydrated. Golden raisins are treated with sulfur dioxide after drying to give them their golden color, black Corinth or Zante currant are miniature, sometimes seedless raisins that are much darker and have a tart, tangy flavor. Muscat raisins are large compared to varieties, and sweeter. Several varieties of raisins produced in Asia are available in the West only at ethnic grocers, monukka grapes are used for some of these. Raisins can contain up to 72% sugars by weight, most of which is fructose and glucose and they contain about 3% protein and 3. 7%–6. 8% dietary fiber. Raisins, like prunes and apricots, are high in certain antioxidants. Raisins are low in sodium and contain no cholesterol, Raisins can cause renal failure in dogs. The cause of this is not known, Raisins are sweet due to their high concentration of sugars. The sugars can crystallise inside the fruit when stored after a period, making the dry raisins gritty. These sugar grains can be dissolved by blanching the fruit in hot water or other liquids, grade A The color is good, and the flavor is characteristic of raisins. These raisins show development characteristics indicative of the fact that they are prepared from well-matured grapes, the processed raisins contain less than 19% moisture by weight. Grade B The color and flavor is reasonably good and these raisins show development characteristics that highlight the fact that the raisins were prepared from reasonably well-matured grapes containing at least 70% water by weight. Margarine is an imitation butter spread used for spreading and cooking. Hippolyte Mège-Mouriès created it in France, in 1869 and he was responding to a challenge by Emperor Napoleon III to create a butter substitute for the armed forces and lower classes. 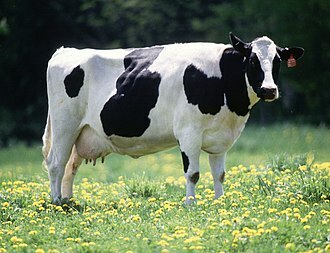 Whereas butter is made from the butterfat of milk, modern margarine is made mainly of refined oil and water. In some places in the United States it is referred to as oleo. Margarine, like butter, consists of an emulsion, with tiny droplets of water dispersed uniformly throughout a fat phase in a stable crystalline form. In some jurisdictions margarine must have a fat content of 80% to be labelled as such. Colloquially in the United States, the term margarine is used to describe non-dairy spreads like Country Crock, Margarine can be used for spreading and cooking. It is used as an ingredient in other food products, such as pastries and cookies. Margarine originated with the discovery by French chemist Michel Eugène Chevreul in 1813 of margaric acid, scientists at the time regarded margaric acid, like oleic acid and stearic acid, as one of the three fatty acids that, in combination, form most animal fats. 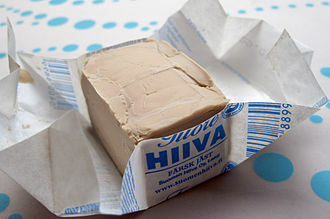 In 1853, the German structural chemist Wilhelm Heinrich Heintz analyzed margaric acid as simply a combination of stearic acid, Emperor Napoleon III of France offered a prize to anyone who could make a satisfactory butter alternative, suitable for use by the armed forces and the lower classes. French chemist Hippolyte Mège-Mouriès invented a substance he called oleomargarine, which shortened to the trade name margarine. Mège-Mouriès patented the concept in 1869 and expanded his initial manufacturing operation from France but had commercial success. In 1871, he sold the patent to the Dutch company Jurgens, in the same year a German pharmacist, Benedict Klein from Cologne, founded the first margarine factory Benedict Klein Margarinewerke, producing the brands Overstolz and Botteram. In John Steeles 1850 California gold miners journal, he wrote, I became acquainted with Mr. Dainels, from Baltimore, manufactured butter from tallow and lard, and it looked and tasted so much like real butter, that. 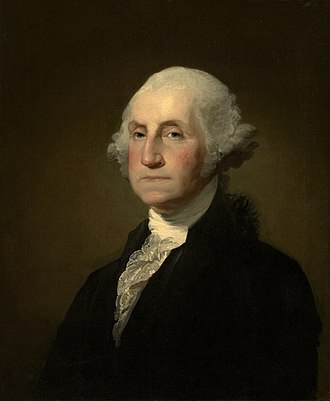 I could not tell the difference, however, he deceived no one, but sold it for just what it was. Flour is a powder made by grinding raw grains or roots and used to make many different foods. While wheat is the most common base for flour, maize flour has been important in Mesoamerican cuisine since ancient times, rye flour is a constituent of bread in central Europe. The English word flour is originally a variant of the word flower, both derive from the Old French fleur or flour, which had the literal meaning blossom, and a figurative meaning the finest. The phrase fleur de farine meant the finest part of the meal, since flour resulted from the elimination of coarse, the earliest archaeological evidence for wheat seeds crushed between simple millstones to make flour dates to 6000 BC. The Romans were the first to grind seeds on cone mills, in 1879, at the beginning of the Industrial Era, the first steam mill was erected in London. In the 1930s, some began to be enriched with iron, thiamine. In the 1940s, mills started to enrich flour and folic acid was added to the list in the 1990s, an important problem of the industrial revolution was the preservation of flour. Transportation distances and a relatively slow distribution system collided with natural shelf life, the reason for the limited shelf life is the fatty acids of the germ, which react from the moment they are exposed to oxygen. This occurs when grain is milled, the fatty acids oxidize, depending on climate and grain quality, this process takes six to nine months. In the late 19th century, this process was too short for a production and distribution cycle. As vitamins and amino acids were completely or relatively unknown in the late 19th century, without the germ, flour cannot become rancid. Degermation started in densely populated areas and took approximately one generation to reach the countryside, heat-processed flour is flour where the germ is first separated from the endosperm and bran, processed with steam, dry heat or microwave and blended into flour again. Milling of flour is accomplished by grinding grain between stones or steel wheels, stone-ground usually means that the grain has been ground in a mill in which a revolving stone wheel turns over a stationary stone wheel, vertically or horizontally with the grain in between. Kringle is a Scandinavian pastry, a Nordic variety of pretzel. The word originates from the Old Norse kringla, meaning ring or circle, in the Netherlands, a particular type of sweet kringle is well known under the Dutch name krakeling. The shape of the kringle has given name to a similarly entangled feature found in some proteins, in Denmark, kringle denotes the pretzel-like knotted shape rather than the pretzel pastry type. Kringler may be made from puff pastry or yeast dough, filled with remonce or marzipan and raisins, sprinkled with coarse sugar, sukkerkringler are similar, sweet pretzels, sprinkled with sugar instead of caraway. Smørkringler are large crusty and sweet pretzels with a spread of butter on the backside, smørkringler are not as popular as in former times. Kringler are pastries with a history in Denmark, and are still popular items in modern Danish bakeries. Nowadays, kringle is usually made only one crossing and not two, as in the original kringle and pretzel shape. In the United States, kringles are hand-rolled from Danish pastry dough that has been rested overnight before shaping, many sheets of the flaky dough are layered, shaped into an oval. 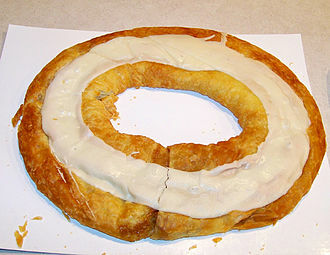 After filling with fruit, nut, or other flavor combinations, the Kringle became the Official State Pastry of Wisconsin on June 30,2013. 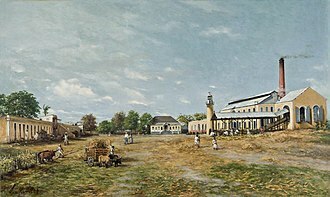 Racine, Wisconsin has historically been a center of Danish-American culture and Danish culture are an important part of Racines cultural identity. A typical Racine–made kringle is a flat oval measuring approximately 14 inches by 10 inches. O & H Danish Bakery, Racine Danish Kringles, Bendtsens Bakery, a Wisconsin distillery, Nordic Distillers of Middleton, Wisconsin makes a Kringle Cream liqueur from real Wisconsin cream, rum and natural kringle flavor. In other parts of the United States, kringle refers to a slightly sweet, buttermilk cookie shaped like a pretzel or figure eight. The Ballard area of Seattle, Redmond, Solvang, central Iowa, Burr Ridge, Illinois, in 2005, Dana College in Blair, held a Kringle Kontest, which was won by Kirstens Danish Bakery in Burr Ridge, Illinois. 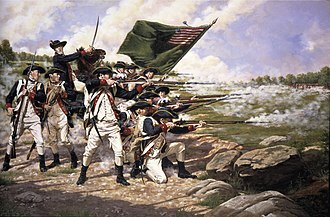 Bakers guilds in Europe has used the kringle or pretzel as a symbol for centuries and it is told, that when Vienna was besieged by the Turkish Ottoman armies in 1529, local bakers working in the night, gave the city defence an early warning of the attacking enemy. Puff pastry, known as pâte feuilletée, is a flaky light pastry containing several layers of butter which is in solid state at 20 °C. In raw form, puff pastry is a dough composed of two elements, a dough packet, the détrempe and a butter packet or other solid fat. Preparing a classic puff pastry requires an envelope formed by placing the beurrage inside the détrempe, an inverse puff pastry envelope places the détrempe inside the beurrage. The resulting paton is repeatedly folded and rolled out before baking, the gaps that form between the layers left by the fat melting are pushed by the water turning into steam during the baking process. Piercing the dough will prevent excessive puffing, and crimping along the sides will prevent the layers from flaking all of the way to the edges, Puff pastry seems to be a relative of the Middle Eastern phyllo, and is used in a similar manner to create layered pastries. Culinary educator Robert Wemischner states that the first printed recipe was published in François Pierre La Varennes Pastissier francois in 1653, for example, twice-folding, repeated four times gives 4 =81 layers. Chef Julia Child recommends 73 layers for regular pâte feuilletée and 729 layers for pâte feuilletée fine, commercially made puff pastry is available in grocery stores. Common types of fat used include butter, vegetable shortenings, butter is the most common type used because it provides a richer taste and superior mouthfeel. Specialized margarine formulated for high plasticity is used for production of puff pastry. Since the process of making puff pastry is generally laborious and time-intensive, faster recipes are common, known as blitz, rough puff. Many of these combine the butter into the détrempe rather than adding it in the folding process and are thus similar to a folded short crust. Puff pastry differs from phyllo pastry, though puff pastry can be substituted for phyllo in some applications, phyllo dough is made with flour and fat and is stretched to size rather than rolled. When preparing phyllo dough, an amount of oil or melted fat is brushed on one layer of dough and is topped with another layer. Bacon and eggs being cooked in a skillet. Quail eggs (upper left), chicken egg (lower left), and ostrich egg (right). Pain au chocolat is a type of viennoiserie. The original Boulangerie Viennoise in 1909 (when it was owned by Philibert Jacquet). 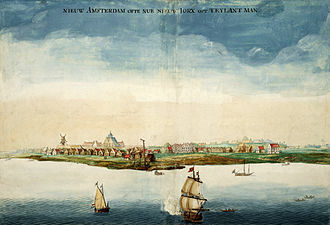 The bakery proper is at left and its tea salon at right. The Baker (c. 1681); oil-on-canvas painting by Job Adriaensz Berckheyde (1630-1693) now held by the Worcester Art Museum. A U.S. Navy baker aboard the USS John C. Stennis aircraft carrier moves a tray of hot, freshly baked rolls onto a cooling rack. A rolling pin is used to work dough. 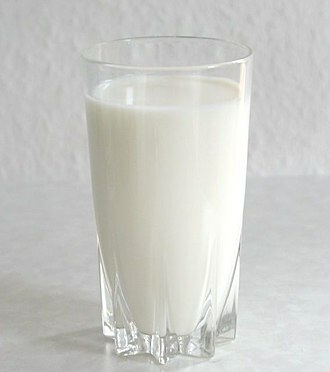 An example of trans fat provided by the FDA. In Denmark, the official kringle emblem of the baker's guild is topped with a royal crown. Here from a modern bakery shop in Ribe. The quince is a hard, golden yellow fruit. The fruit was known to the Akkadians, who called it supurgillu. Traditional quince cheese ("cotognata") on display at the Ortygia market in Syracuse, Italy.